Toscolano is located on the quiet west side of Lake Garda within a beautiful 14th century monastery setting. Close to lively Italian villages, mountain trails and lake excursions, Toscolano is an ideal base to explore the area. With luxury camping site facilities including a pool, sports equipment and entertainment, families and couples can enjoy a relaxing, sociable holiday in the heart of nature. Located in Toscolano Maderno in Brescia, this luxury camping area is nestled between mountains and a lake, with views of the surrounding protected area of natural beauty. Whether you are looking for boat trips, hikes or simple beachside relaxation, Toscolano has something for all the family. Back at base, you can enjoy luxury mobile home accommodation with well-provisioned facilities and entertainment. 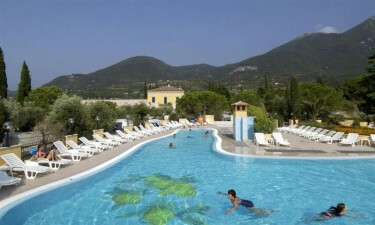 For your next camping holiday to Toscolano, book with LuxCamp. 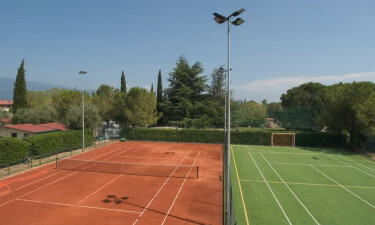 Sports court, field and equipment. Children's club in high season. Entertainment in the day and evening. With a swimming pool and children's paddling pool, guests can swim or sunbathe with spectacular mountain views. The pool's surroundings are well provisioned with shaded spots, deck chairs and showers; your kids won't want to leave! With direct access to a pebbly beach, this is an ideal place to relax, dip your toes and kick your feet up beside the lake. Boats are accessible nearby with daily cruises around Lake Garda, and there are many trails in the area for exploring.